Autumn Jewel is a collection of four components. The pincushion stands on its own as a beautiful place to keep pins. 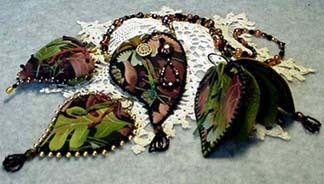 Remaining accessories can be worn as a chatelaine alone or together as desired. The beaded neck strap is completely detachable allowing this versatility.